Dr. Roberta Bondar is a lot of things. She's a scientist, a physician, an astronaut, a photographer, an environmentalist, an author, a pilot, an educator, an adventurer, an impassioned speaker and a dreamer. She can also be quite the comedienne. Dr. Roberta Bondar is a lot of things. She's a scientist, a physician, an astronaut, a photographer, an environmentalist, an author, a pilot, an educator, an adventurer, an impassioned speaker and a dreamer. She can also be quite the comedienne. But there's one fact that Dr. Bondar won't let anyone forget. She's the most proud Saultite anyone could ever hope to meet. This was perfectly clear as she spoke to hundreds of students gathered at the Kiwanis Community Theatre Centre Tuesday morning. In addition to outlining her numerous achievements and discussing the motivators that lead her to where she is now, Dr. Bondar answered student submitted questions from the Algoma District Public School Board, the Huron Superior Catholic District School Board, the CSCNO Notre-Dame des-Grands-Lacs. "What is your favourite place in the world that you will always want to go visit?" asked the Grade 10 science class from St. Basil's Secondary School. The Sault Ste. Marie area has as much natural splendor as anywhere else in the world, Dr. Bondar explained, and she'll always come back here because she feels very privileged to be able to call the area home. The focus of Tuesday's talk, however, was to encourage the students to follow their dreams, explore themselves and their environment, and convert obstacles into opportunities in order to reach their potential. And according to Dr. Bondar, luck plays an important role when skills and opportunity converge. But first you must have the ability to recognized it and the motivation to take advantage of it. "You can make luck happen," she said. "If you didn't have that skill set, you'd never recognize that opportunity. And if you have a dream and it's persistent, you've got to be able to grasp that opportunity. You'll make luck happen because you are prepared." On Wednesday, January 25, Dr. Bondar will continue her three-day itinerary in the Sault with a special presentation at the Great Lakes Forestry Centre from 9:30 to 10 a.m. to honour the 20th anniversary of her space mission aboard the Space Shuttle Discovery. From 2 to 4 p.m., the Art Gallery of Algoma will host a reception in her honour during which a selection of her photographs will be on display. Dr. Roberta Bondar was chosen as the Sault's Honourary Celebrate 100! Community Ambassador, and at Monday's City Council meeting Mayor Debbie Amaroso officially declared January 23 through January 30 as Dr. Roberta Bondar Days in Sault Ste. Marie. 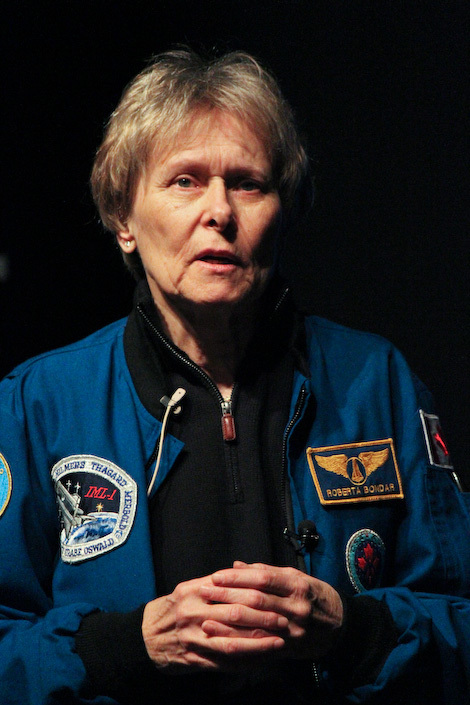 To learn more about Dr. Roberta Bondar, please click here.